Chinese smartphone maker Xiaomi is expected to hit the market with two new handsets. While a leak has showcased an all new Xiaomi Mi 6X, another has revealed more details of the Mi 7. The Xiaomi Mi 6X is said to be the successor to Mi 5X, which was launched in July 2017. Notably, the Xiaomi Mi 5X was rebranded as Mi A1 in India, and shipped with stock Android as an Android One offering. Meanwhile, the Xiaomi Mi 7 is expected to be the company's next flagship smartphone that could be launched at MWC 2018. 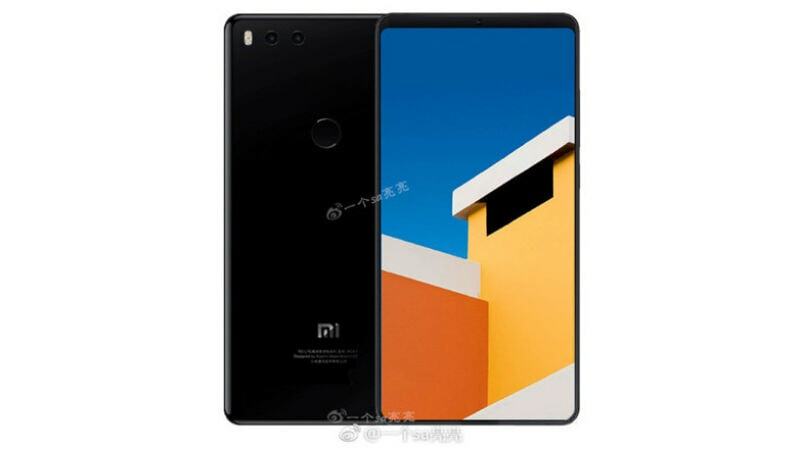 While there have been several rumours going around regarding the Mi 7 smartphone, the latest renderhas come from Naijatech which has cited a Weibo leak that showcases the back side of the smartphone. On the rear end of the smartphone, there is a horizontally aligned dual camera setup along with an LED flash. Interestingly, the report also suggests that the smartphone may support wireless charging. Additionally, CNMO has also leaked another image showing the front side of the smartphone. Both the leaks, suggest that the Mi 7 may feature a traditional fingerprint scanner on the back. The image also suggests the presence of a thin top bezel and none at the bottom, reminding us of the Mi MIX 2 design. Earlier, Xiaomi had announced that the Mi 7 will be the first smartphone to feature Qualcomm's Snapdragon 845 SoC. Notably, another report had suggested that the smartphone will sport a proprietary face unlock feature and abandon the traditional fingerprint scanner. Also, some reports have claimed the presence of a 6-inch bezel-less 18:9 OLED display on the Xiaomi Mi 7. Meanwhile, an image of a back cover, allegedly belonging to Xiaomi Mi 6X has reportedly leaked on Chinese microblogging website Weibo. Confirming the leak, Slashleaks posted case renders of the Mi 6X which shows edge-to-edge display and a vertical dual-camera setup. Another image leaked on Weibo has showcased the back cover of the Mi 6X. Meanwhile, there is also a circular hole in the middle of the rear panel, which could be the placeholder for a fingerprint sensor. Also, images showing the front side suggests that the Mi 6X may come with a full-screen design, with an aspect ratio of 18:9. Since the Mi A1 was seen as a rebranding of the Mi 5X, the Mi 6X could possibly be launched as Mi A2 in India. Also, Xiaomi could go for a mid-year release for the Mi 6X as seen with the previous variant. While the company has already confirmed it will be present at the Mobile World Congress, Mi 7 could be its biggest launch. However, with all rumours and leaks, it is advisable to take the above information about the Mi 7 and Mi 6X with a pinch of salt, as Xiaomi has yet to make any announcements about its new smartphones and the credibility of the sources cannot be independently verified.